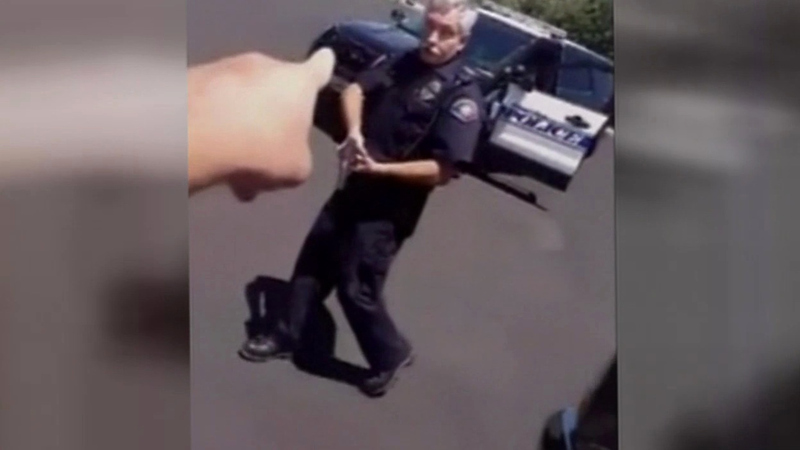 ROHNERT PARK, Calif. -- The Rohnert Park Department of Public Safety canceled Thursday morning's scheduled "Coffee with a Cop" event with community members in the wake of a video released of an officer drawing his gun during a verbal confrontation with an unarmed resident. The video posted on Facebook July 29 by the resident, Don McComas, has gone viral and is drawing heated reaction from citizens on social media sites. The Coffee with a Cop event was scheduled for 8:30-10:30 a.m. today at a McDonald's restaurant on Commerce Boulevard before the department announced its cancellation. "We have information that individuals from outside the community have voiced an interest in using this event to cause a disturbance, potentially putting our community as risk," the department said in a statement this morning. In the 5-minute video posted by McComas, the officer arrives in a patrol car at a residence and remains in his car while McComas records the contact on his cellphone. The officer gets out of the car after about 90 seconds, approaches McComas with his gun drawn and tells McComas to take his hand out of his pocket. McComas objects and tells the officer he has done nothing wrong and tells the officer to go away. "You guys have done enough to my family," McComas says, and accuses police of being corrupt. When the officer asks why McComas is recording the incident, McComas replies "to protect myself from you." "Are you some kind of constitutionalist crazy guy?" the officer asks at one point. Rohnert Park Mayor Amy Ahanotu and City Manager Darrin Jenkins said in a statement Tuesday that they are aware of the matter and are taking it seriously. They said they are conducting an internal review to verify if appropriate protocols were followed. "We will also review our protocols because we want to make sure we are using the best practices for the highest level of safety for both our officers and the community," Ahanotu and Jenkins said.